It is Thursday...we are in the home stretch friends! 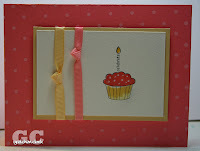 This is the card I sent to my SIL, Dawn for her birthday last week. I used my SU! set Cause for Celebration. I love the cupcake image from this set...so fun! I stamped the image on watercolor paper and colored it in with my SU! markers (I don't have Copic's). I then used my gel pen to add some sprinkles to the top. Random ramblings...yesterday after work I drove to Paradise Vally Mall in North Phoenix (I think it was N Phoenix...I am direction challenged) to pick up a Tuxedo jacket for Josh. He is going to the prom with his girlfriend this Saturday. He went shopping for one and got the wrong size...a short...He is 6 feet tall, definitely needs a regular not a short. Unfortunately our local store did not have one in his size, so after calling around I found one far, far away (lol) and went to pick it up for him, so he will look pretty snazzy on Saturday (I will post pic's next week).